Stephen Clark Keppeler is a natural born story teller. He tells a spellbinding story in English as well as in Spanish. Like my Nana he probably tells a story best Spanglish. I feel fortunate to be the first to publish this fine new Californian author. 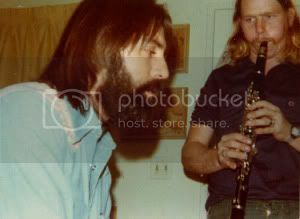 Steve was also a member of the original Rancho Bozo Review he played sax and clarinet. JESSE LOVES JUANA 1936. Those were the words I read, etched into the wood on the top right corner of my school desk, just left of the ink well. My first thought was what a jerk Jesse was to proclaim his love so openly where everyone could see it. My second thought was: Doesn't this school buy anything new? I was sitting at that desk in the early minutes of the first day of summer school. I was between the fifth and sixth grades. My teacher was Mrs. Butcher, and all the kids knew she was the meanest teacher in the school. Later, I realized it had everything to do with her name and nothing to do with her demeanor. It was the summer after the national tragedy of the President's assassination, and the minor tragedy of the Los Angeles Dodgers losing the World Series to the New York Yankees, the autumn before. It wasn't supposed to happen like this. One of my older brothers, Tim, and my best friend Salvador were supposed to retrieve me before class started: I was going to play hooky all summer. We were supposed to go to the Rio Hondo. The Rio Hondo was (and, I'm sure, still is) an area where all the water washing off the streets of Los Angeles and surrounding areas through large underground canals  like where they made some of those 1950's horror movies with big ants or whatever  eventually emptied into a large open canal. Its final destination was a recreation area, with swimming holes that had crawdads, frogs and pollywogs, and surrounding land that was home to lizards, snakes, and horned toads: in other words, everything a boy between the fifth and sixth grade would love. But Tim and Sal never showed up. You might wonder why I didn't just cut class without them; but at that age I felt more comfortable and less guilty with what might be perceived as accomplices. As I yawned and grew bored reading Jesse's proclamation of love for Juana  and wondered what kind of knife he might have used  Mrs. Butcher ordered us to stand up from our desks because we would not need them this summer. She told us to move the desks from the center of the room out to each side, in order to create a large space in the middle. I had a feeling that something horrible was about to take place and I tried not to think about it. It was then that I noticed a hi-fi and some records on her desk in front of the chalkboard, and I had a sinking feeling that the near future held some embarrassing moments for me. I became that much angrier with Tim and Sal for not saving me from this dilemma. My intuition proved to be correct when Mrs. Butcher announced to us all, "Children, we are all going to learn to square dance this summer." She ordered the boys to one side of the room and the girls to the other. With that accomplished, she said, 'I'm going to do something different this year. I want the girls to walk across the room and pick their dance partner for the summer." I was in shock. I couldn't even get a Valentine card from a girl when it was somewhat mandatory. I knew in my heart that no girl would choose me, and I would spend the summer having to dance with Mrs. Butcher. So what happened next was extraordinary. A girl named Marina who I had known since kindergarten walked up to me and said "Stephen, will you be my dance partner?" Nervously, I said yes. but Marina had a little darker complexion, which  to me  made her that much more attractive. but it was suddenly clear that neither of us wanted the other to be embarrassed, and that we seemed to care for one another  a new feeling for me, and perhaps for her, too. but he seemed to enjoy himself just the same. That night, my brother Tim told me that Sal and he did not meet me before class that morning because they got up too late. But they had gone to the Rio Hondo anyway and had seen a large gopher snake. They were going back the next day to try to catch it, and did I want to come along? I said "Sure." and then I looked through the open door and saw Marina. She was leaning against the radiator directly across from the door. She had a sad look on her face, and I think she knew that I was about to cut class and never come back. I had the feeling that she knew I was kind of a bad egg, and probably knew that Tim and Sal were, too. So I told Tim and Sal to go without me. I was going to stay. Tim gave me a little push, laughed, and called me a sissy punk. Then they left. When I walked in the room, Marina broke out in a big smile and it made me feel good. After class I walked her home  or at least, within about five houses of her house. I asked which house was hers, and she said it was the one with the old car that her dad was repairing in the driveway. It was an old Buick, maybe a 1948, '49, or '50. It had a bold-looking grille, portholes in the fender, and two chrome sort-of bullets protruding from the bumper. One day while walking home with Marina I found a pen laying on the ground. I picked it up and asked her if she wanted it. She laughed and said, "No, you keep it. It's just a pen." Then she got solemn and asked, "Stephen, do you know the only thing I don't like about square dancing?" I thought, "Oh, no. Here it comes. I did something wrong." Nervously, I replied, "What?" "It's when the caller says Change your partner,'" she said, "And I don't want to change my partner, ever." When I got home, I put the pen in a drawer next to my bed, and for a while, I forgot about it. Marina and I danced for six weeks that summer. On the last day of summer school I walked her to the same spot, about five houses from her house and the Buick. She turned around, looked me in the eyes, and gave me a kiss on the cheek. Then she skipped off  but after a few steps she looked over her left shoulder and said, "I'll wait for you in the sixth grade." but to say the least, I was a little disheartened. It was about two weeks before Christmas vacation when I saw Maria Avila crying in the hallway and talking to some girls. It wasn't so unusual because Maria cried all the time. I always thought it was because she was so much taller than the other girls and felt out of place... but, heck; she was also taller than most of the boys. The next day at school I heard a rumor that Marina had died of some disease. I never verified it, but I do know that I never saw her again. That same day I walked the same path that Marina and I walked to her house the summer before. When I got within sight of her home, I was hoping not to see the old Buick. I hoped that they had simply moved away or something. But there sat the Buick: The right front tire was half deflated, and instead of a mean-looking grille and bumper, it just looked a little sad. The next morning I rose early to go to school, which was unusual for me. I took the pen I had found with Marina out of the drawer and brought it with me to school. At lunch recess I went back to Mrs. Butcher's room and, luckily, found it empty. I located the desk where Jesse had so boldly proclaimed his love for Juana in 1936. I lifted the lid, and on the underside I pressed the pen as hard as I could to inscribe the wood: "Steve loves Marina 1964." Then I closed the lid and left the room. I thought a lot about Marina after that, but not too much about Jesse or Juana until a year or two later, when my oldest brother Ken graduated from high school and joined the Army and went to Vietnam. I worried about Ken; but I thought about Jesse too, realizing that he would have been the age to go off to World War II. I wondered what kind of story he and Juana might have had  if any story at all. Most of the time, you should expect what you suspect; but once in a while, when you expect the worst, something magical happens and the memory can last a lifetime. Sometimes in life, the most intimate moment you experience might be two sweaty hands clasped between two people, or a simple kiss on the cheek. February 14th is when we celebrate Valentine's Day, the day to express love. But a Day of Love does not have to be every February 14th and it does not have to be only for a day. For Marina and me, it lasted six weeks, during a summer many years ago.